Guest can enjoy a free workshop, food and more! 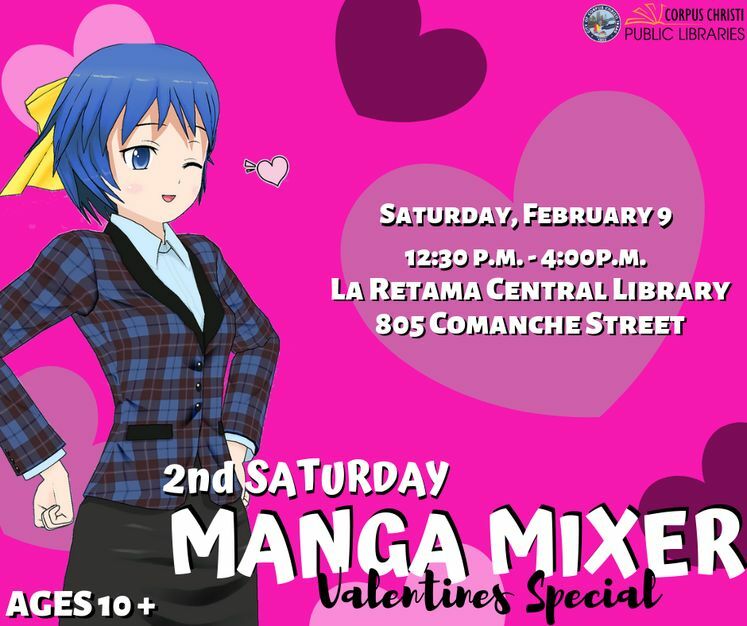 CORPUS CHRISTI, TX – Join in the love for anime and Japanese culture at La Retama Central Library’s Valentines Special Manga Mixer! Anime enthusiasts will gather Saturday, February 9 from 12:30 p.m. to 4:30 p.m. at 805 Comanche Street. Guests are encouraged to cosplay and will be treated to an afternoon of sweet snacks and a free showing of the popular anime series, “Ouran High School Host Club.” Artists from K Space Contemporary will also demonstrate incorporating Japanese calligraphy into handmade Valentine’s Day cards for your sweetheart.